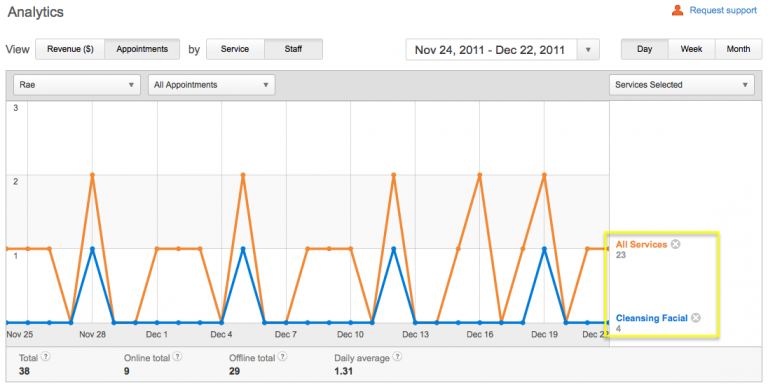 Learn how to view and track important business metrics. Genbook’s Analytics tab is a resource that allows your business to see and track appointment metrics over various periods of time. 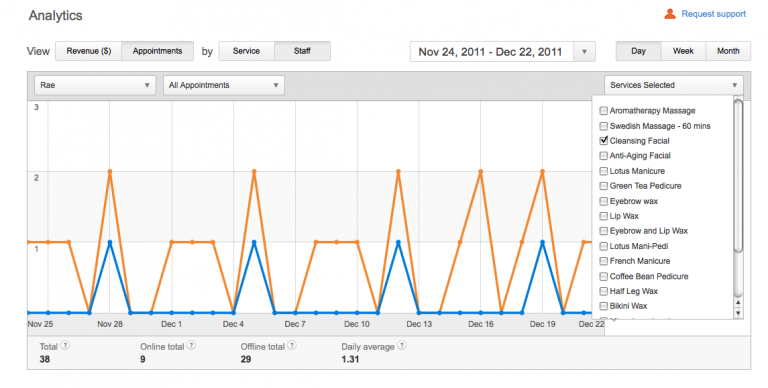 You can view trends in both number of appointments and revenue, and even isolate the data you look at by staff, service and booking type (online vs. offline). The best way to fully understand and get the most out of the Analytics tab is to play around with it within your own online booking account. Below, you’ll find a brief overview on how to use it. You’ll notice right away when looking at the tab that you have both a line graph on which you can view data, as well as bar chart/table Staff and Service Summaries below that. Time Frame: The first thing you want to do is select the time frame you wish to draw information from. The time range you select at the top will apply to both the graph and the summaries below it. The default time frame will be the most recent 4 weeks. However, click on the date range and you will be able to select shorter or longer spans of time at which to look. Depending on the amount of time you’re looking at, you can also choose to view the graph in increments of Days, Weeks or Months. For example, to see an overview of your monthly earnings or appointments over the course of one calendar year, you would click the “Month” button after selecting the date range. Views: Next, you will need to decide whether you wish to view data about Revenue (amount of money earned) or Appointments (number of bookings) in the top graph. There are similar options for each of the summaries. One important thing to note about the Revenue views is that all details are based on what is listed in the Revenue field on your appointments. This field is found on each Edit Appointment box. 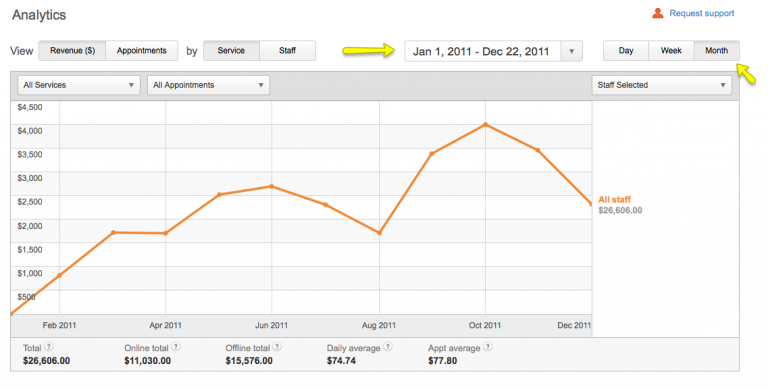 If you list a cost for a service, the Revenue field is automatically filled in with the service’s listed cost. 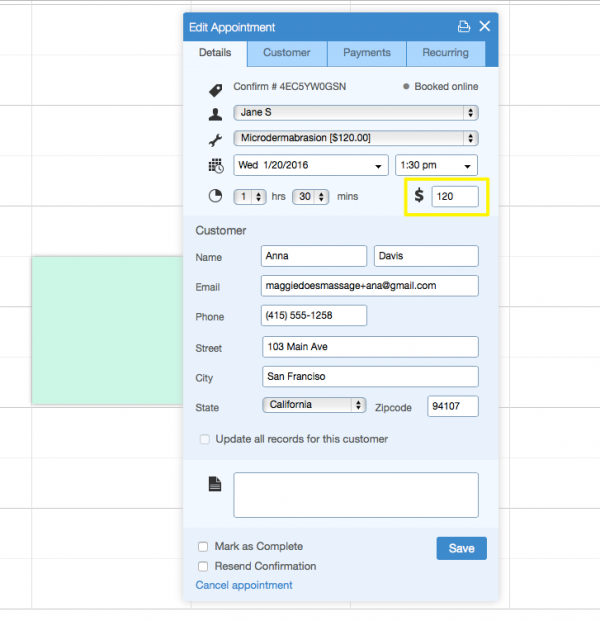 When you’re creating an Offline appointment, you can edit the Revenue field. Once you have selected a time frame and view type for your graph, you can also choose to view the graph by Services or Staff, which allows you to select from either of those categories. Within either the Staff or Service subviews, you can narrow the graph further by choosing to view only Online or Offline appointments, from the drop-down menu to the immediate right. 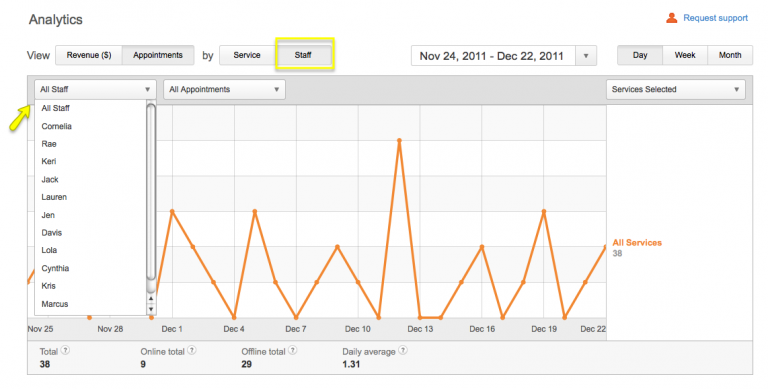 You can even select to view appointments/revenue for a particular service, juxtaposed with the staff member’s totals. 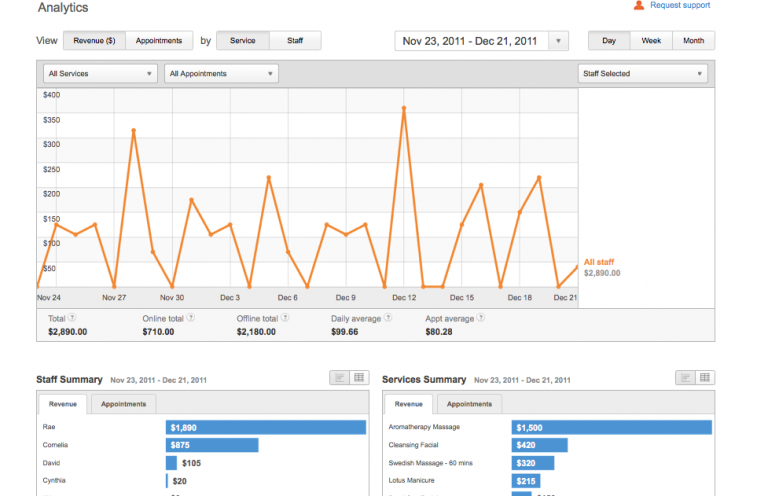 There are numerous options and combinations of options for viewing data in your Analytics tab. Whether you want to home in on which services bring in the highest revenue, or which months of the year see the most appointments for a particular service, or even which of your staff members takes the most Online appointments, there’s a way to do so using this feature. As always, don’t hesitate to reach out to our Customer Care Team (via the Support links in your account) if you have any questions, comments or concerns. Staff members (when they are in the account using their designated logins) do NOT see the Analytics tab. If you have not granted your staff members their own access rights to your account, you can find instructions on doing so here. Analytics data is not valid for taxation purposes.